We are pleased to welcome you on board of "Aledo" to offer you a pleasant and exciting holiday. 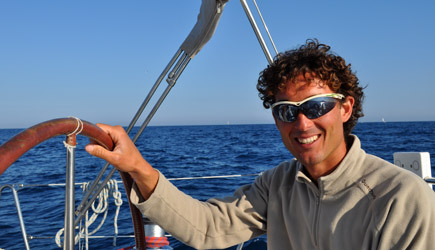 ALESSANDRO, skipper of "Aledo", he begins to practice the sport of sailing at the age of 5 years, gained experience of 470, Laser and sport catamarans (Dart 18). At 14, his first sailing on the high seas aboard a Comet 1000. At age 16 he became the skipper and with his father Gianni creates the association VELAMANIA organizing excursions and charter boat sailing aboard "Caterina". In 2004 he purchased "Aledo", Oceanis Clipper 423 of 13 meters, with which it continues to work in the field of sailing. In 2005, part for a bike trip in Florida that is transformed, with the purchase of a boat of 7 meters ("September Song") on a travel sailing through the whole Caribbean Sea. 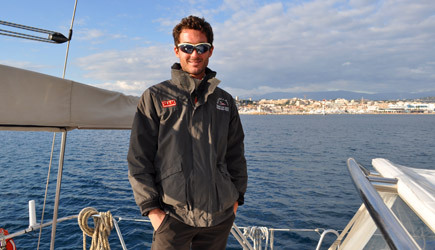 ALESSANDRO spent the following winter seasons to sail in the Caribbean islands acquired a great knowledge of that areas. During the summer he continued VELAMANIA activity in the Mediterranean. In the winter of 2007/08 have worked as a skipper of a cruising catamaran (Lagoon 440) in the Caribbean between Martinique and Grenada. Since 2009, greeted the Caribbean to undertake the activity of winter sailing school in the Mediterranean, integrating it with the summer tours and charter.